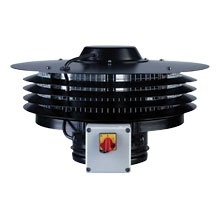 CTB roof exhaust fans are designed for ventilation of rooms with a low degree of air pollution. They are used in exhaust systems from flats, toilets, offices, shops and warehouses. Roof radial fans mounted directly on the ventilation duct, with the impeller backward curved, made of galvanized sheet steel. The fan casing is made of galvanized steel sheet, painted with epoxy paint. All models are equipped with a protective mesh. The CTB fan series consists of four sizes for the diameters of 160, 200, 250 and 315 mm ventilation ducts. Each of CTB fans is standard equipped with a service switch with IP 55 protection level placed on the fan casing and a connection piece with a rubber gasket. CTB fans are equipped with single-phase 230V 50Hz induction motors with an external rotor, IP 44 protection class and F insulation class.